Happy Thursday! This is a happy but stressful Thursday for me. I am having a slight panic attack while writing this because I am driving down to North Carolina tonight. I had this trip planned with my mom to take a long weekend down to Asheville and Charlotte to visit friends and look for my moms dream house. Well, I hadn’t anticipated that the government shutdown would end the same day I had to leave! Yep, the day I was set to leave for vacation, I had to return to work. I’m scrambling right now to write this post and get on the road! But today is the second to last Picture Polish Thursday! Can you believe it? Time really does fly by. I can’t believe that I’m in my eighth week of doing this! I was so excited to review this polish because it is stunning in the bottle and is another one of Picture Polish’s famous collaboration shades. 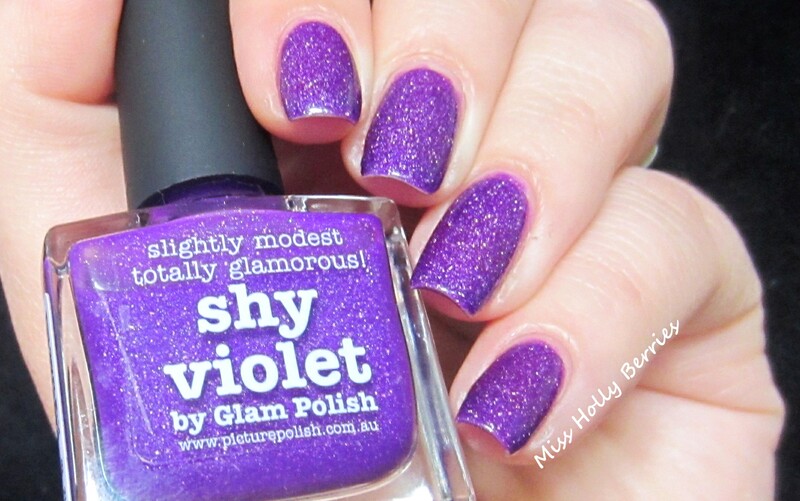 Picture Polish “Shy Violet” is a medium toned violet purple with a ton of rainbow flecks. I’ve never been able to get these types of polishes to photograph that well. The polishes with those silver holographic flake particles really glow on the nails, but never translate that well in pictures! Hopefully you guys will trust me when I say this polish shines! While the color is gorgeous, I can’t say the same for the formula. This is 4 coats in the pictures. Yep, 4! My heart just sank when I saw how sheer this polish was. I don’t know if I got a dud or what because I’ve never heard of others complain about their bottles being sheer. The dry time was great though, so I wasn’t spending a ton of time painting and the consistency was really nice. I just have one more week and I saved a “lemming” polish of mine for last! What do you guys think? 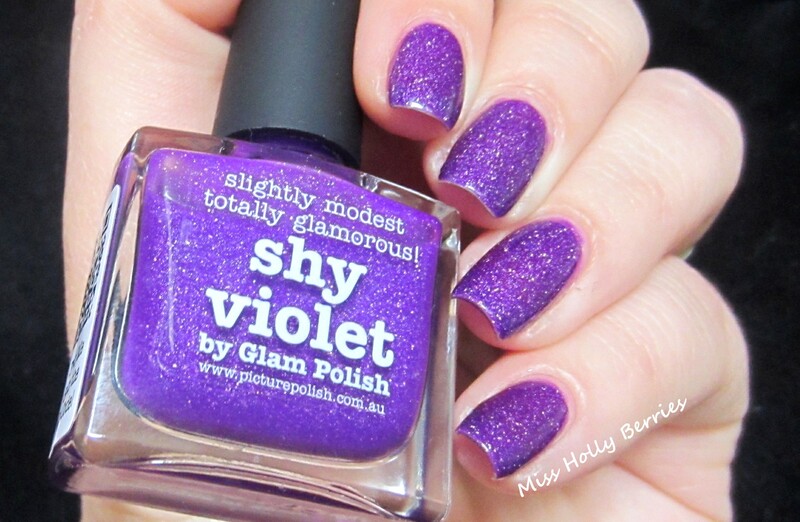 What are your favorite purple polishes? ← Halloween Nail Tutorial! Back From The Grave Nails! awww thanks! picture polish is amazing but expensive. there are a few that are totally worth the money. and thanks for the link! Lovely color! I think this looks stunning! Too bad about the sheer-ness that is literally always the worst! agreed! it is a gorgeous color but i’m hoping i can find something similar with a better formula. thanks for coming over to my blog kallie! awww thanks donah! 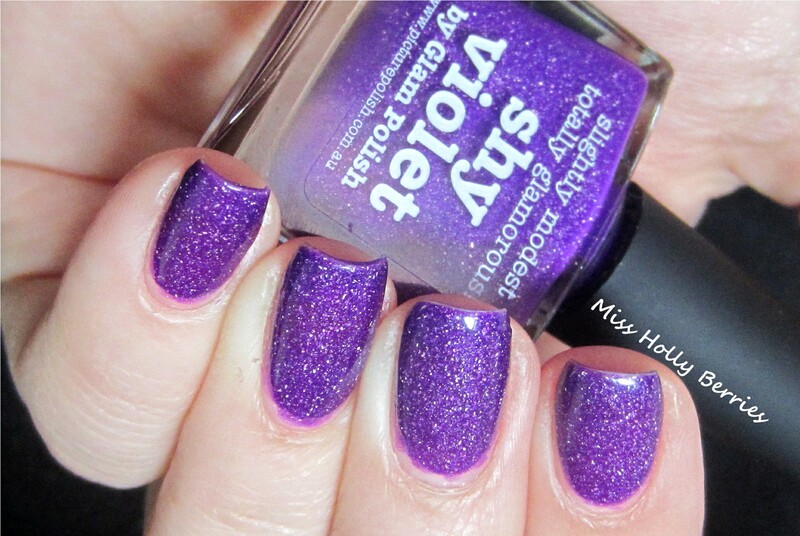 i wish they weren’t discontinuing this shade because its so pretty. thanks for commenting!